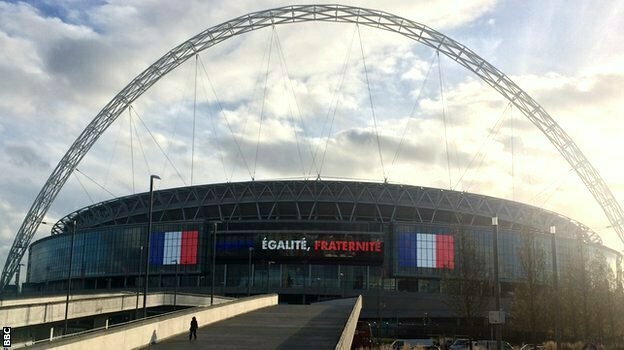 England’s match against France at Wembley on Tuesday will not be a “normal friendly” following the attacks in Paris, says coach Roy Hodgson. A total of 129 people were killed in attacks across the French capital on Friday. “I can’t deny there’s something hanging over which is far, far greater than a football match,” said Hodgson. Football Association chief executive Martin Glenn added that the game would have “massive global significance”. France’s game with Germany at the Stade de France was targeted in Friday’s attacks. A Belgian citizen has been identified as the mastermind of the attacks, and Belgium’s friendly with Spain on Tuesday in Brussels has been called off because of security fears. England’s players observed a Europe-wide one-minute silence at 11:00 GMT on Monday before their training session. 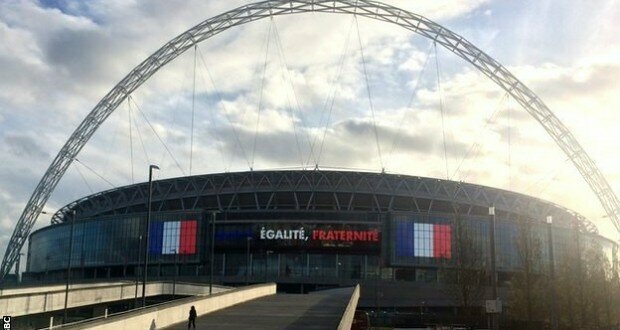 During Tuesday’s game, Wembley’s arch will be lit up in the red, white and blue of the French flag to show solidarity. Extra officers will be on duty for the game, including armed police. Screens outside the ground have already been showing the French motto ‘liberte, egalite, fraternite’, and before kick-off the words of the French national anthem – La Marseillaise – will be shown for any fans who want to join in. The Duke of Cambridge will also be in attendance, Kensington Palace has confirmed. Prince William, who is president of the FA, was not scheduled to go, but decided to after Friday’s attacks. The FA is expecting a near-full house at the 90,000-capacity stadium, with thousands of tickets sold since the attacks and fewer than 100 returned. Meanwhile, England captain Wayne Rooney said he was “sickened” by the images and footage of the attacks in Paris. He added: “It’s a sad time and in terms of going on the pitch we can only do that in the understanding that all the security checks have been made and it’s safe to do so. Unless we are told otherwise we are assuming that we are right and ready to play. The FA is urging fans to get to Wembley early because of increased security checks. Chief executive Glenn said: “We spoke to the French Federation on Saturday, and were in touch with the French president’s office and there were two conditions to hold the game. He also added that the eyes of the world would be on Wembley Stadium on Tuesday. “This is going to have massive global significance – the first major event since Friday,” he said.